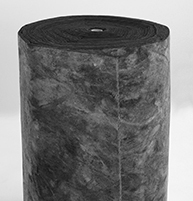 Duct liner is both thermal and acoustic insulation. It is manufactured from inorganic glass fibers bonded with a thermosetting binder. The airstream surface is faced with a black mat bonded to the black fiberglass substrate.